I was mulling over the Birth by Sleep Ultimania and came across an image of this room. I don't remember or recognise it from anywhere in the game at all. It's specifically located in the "minigames" section of the Ultimania, leading me to believe it's perhaps somewhere from the Mirage Arena. Would anyone who can read Japanese possibly be able to translate, or show it to someone who does? The textures give it the appearance of a location in the Keyblade Graveyard but it's definitely *not* any playable room I've seen in that world. Not the Seat of War, Twister Trench, the save point room OR the Badlands. Keep in mind this Ultimania is for the vanilla version of Birth by Sleep and not the final mix version, so it's not something that was added later. 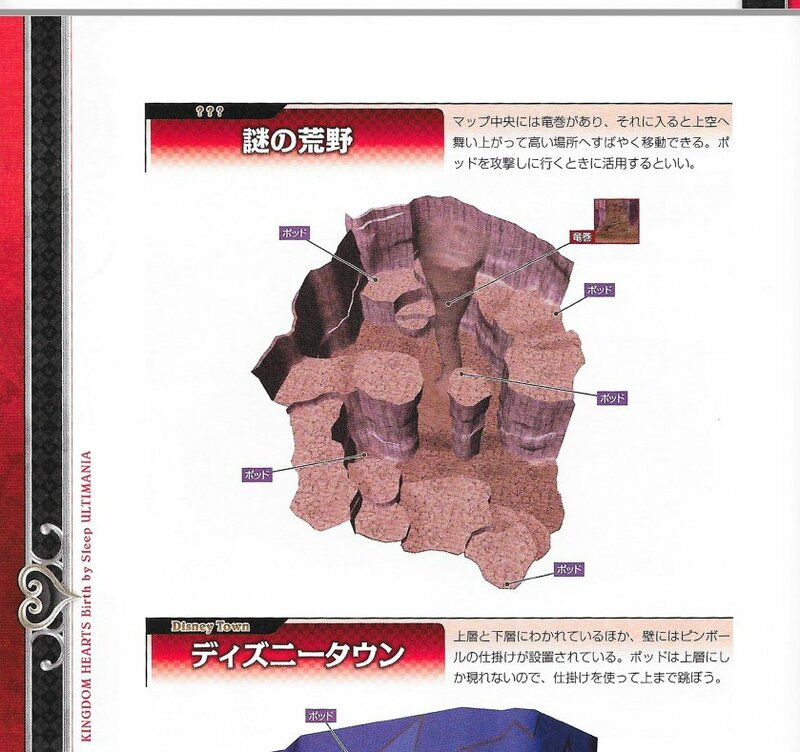 I feel like it must be some kind of deleted room, but the fact that the Ultimania specifically mentions it and labels it and points out things in it, and places it in the MINIGAMES section says otherwise. Any answers or thoughts (or translations)? Is it just one of the rooms from one of the Mirage Arena matches and that's it??? Well, I have a bit of an answer and a bit of a non-answer for you. So...I'll do what I can to translate the scan. (apologies in advance if it is rather...direct). So up in the red section is the world name. There are some ???? followed by, roughly "Mysterious Wasteland". The map itself has several purple boxes marked as being "pod" locations scattered around. The text next to the red "world name" says "In the center of the map is a tornado, if you enter it, it will lift you up and allow you to reach higher ground more easily. This is great for when you want to attack the pods." The section below that is for a different map, obviously located in Disney town. I can't see the map (but notice there are also pod locations marked) and the text next to the world title says "In addition to the upper and lower levels, there is a pinball mechanism in the wall. Because the pods only appear on the upper level, use the pinball mechanism to quickly spring up." So judging from the translations, obviously this is some game where, within different worlds you gotta go around and attack "pods", presumably under time pressure. Since they are giving hints about how to quickly move about the map. I dunno if this has to do with those magic pot things that appear that drop candies and sweets when you attack them but...maybe? That's all I can tell you. Maybe someone who knows BBS specifically better can figure out what game this is referring to. Unfortunately it's probably the game I know the least about. Mysterious Wasteland: entering tornado in the middle of the map will fling you into the air allowing you to access higher areas. good to use when attacking pods(?) (the purple arrows point to "pods(?)" and the red points to a tornado)"
I see! Well I'm glad you got at least a little bit of information that you were looking for. If I'm not wrong, it's a room exclusive to multiplayer on the PSP. I remember playing in a room exactly like this with my buddies back in the day, and wondering why the layout was so weird as well as questioning and hopping on the tornado in the middle of the room. If I'm not wrong, it's a room exclusive to multiplayer on the PSP. Thanks for narrowing this down. I was very curious about this as I never got to experience this myself, on the vanilla or FM versions of the PSP versions I've played. Just another reason I'm a little sad multiplayer was dropped from the HD ReMix.